DKNY is a New York-based fashion house founded by Donna Karan. It specializes in fashion goods for men and women. The unique style has become an internationally acclaimed brand that is also known for its wallets, fragrances, and other accessories. With Big Apple Buddy’s personal shopping service, you can now buy direct from the DKNY online store anytime, anywhere. Get one of the most popular options of the DKNY dress collection. The Mixed Media Full Dress has an intricate design that will let you start off the season with a bang! Made from wool and mohair, this high quality material makes the dress soft to the touch and perfect for the chillier weather. It manages to have an elegant yet sporty look with differently dress styles that seamlessly combine. 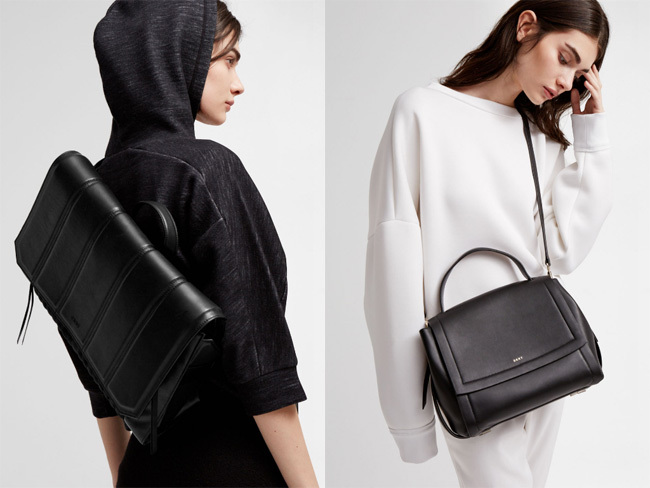 The DKNY Nappa Crossbody Backpack is the only bag you'll ever need! In a unique and amazing combination of a crossbody and a backpack, this bag is ideal for any occasion where you have a lot of things to carry. You can comfortably take all your essentials in this sleek hybrid as you strap it to your back and have your hands free. The compartments help to organize as well. Don't miss out on one of the classics with the DKNY Turtleneck Bodystocking. This top gives you the freedom to layer as you like according to the weather and to your style. The technology of this material is impressive as well - it regulates your body temperature and allows for breathability. It also expands easily so you can move around as you like while giving you a sleek and chic look. Unfortunately, the USA DKNY online store does not currently offer international shipping. However, Big Apple Buddy, your personal shopper, can help you buy products direct from the official USA DKNY online store and ship them to your doorstep, no matter where you are in the world. If you would like to buy from the USA DKNY online store, simply let us know which items you would like to order (by filling out the form below) and we’ll get back to you with a free international shipping quote within 24 hours!